He’s named after a book about flying to the moon. And from the photo, you can see he was keen to take off long before race day! It was great to see Destination Moon get his first win last Friday at Alexander Park. The field was not nearly as strong as his first race a couple of weeks earlier, which was a Sires Stakes heat with the speed on, but the way he won was impressive. He reached the front early and ran confidently in the lead, not switching off, keeping a good margin to the others and pulling away to win by over 2 lengths with little encouragement needed from Joshua Dickie in the bike. Destination Moon is the half brother to Tintin In America and full brother to The Blue Lotus (3rd in Sires Stakes Fillies 3yo final), from my wonderful mare Zenterfold. His sire Grinfromeartoear is not highly commercial but if you get the right match he adds a lot of value and leaves some tough horses with speed. “Duncan” (as we nicknamed Destination Moon) was a lovely type as a yearling and sold for $68,000 to Rosslands Stud Ltd (Kerry Hoggard) at the 2012 yearing sales. He has shown up in his workouts and qualifying trial just prior to racing, but pleasing to see there wasn’t a rush to get him into the 2yo Sires Stakes if he wasn’t ready. Recently I spoke to trainer Steven Reid about Destination Moon’s next steps, and he says he will be racing till the end of June then have a spell before being aimed at the 3yo Sires Stakes heats, which come up early in the new season and culminate around NZ Cup time. He describes Destination Moon as having the potential to step up and be quite a good horse. Tintin In America and The Blue Lotus now have a Real Desire half brother weanling who is hanging out in our paddock with a full brother to Flying Isa, great mates. More about him and an update on other branches of the family coming in a blog soon. Destination Moon’s pedigree is one I wanted because Grin offers some physical and genetic influences that really complement his dam Zenterfold. I have always taken on board Aria Small’s advice that the family love the old blood – the Spinster/Old Maid/Scotland connections, which it has on its bottom line through Bachelor Hanover. And that has been a touchstone for me in getting a good nick for the mare. Grin hauls that old blood up through his remarkably close-up Storm Damage damsire, and also in his maternal line through Shifting Scene and Race Time (a son of Breath O Spring and half brother of Storm Damage). Shifting Scene is part of the lovely Golden Miss maternal line that you see in many classy families (Rich N Elegant, Real Desire’s maternal line etc) and of course the overlooked element in that line is my dear old Shadow Wave. In Zenterfold’s pedigree, Shadow Wave pops up promptly as the damsire of New York Motoring, who I believe is a key figure in what have developed into the two best branches of the Zenover family – Interchange and Zenola Star, both sired by New York Motoring. Finally you have the Direct Scooter and Tar Heel influences of In The Pocket, the sire of Zenterfold and so grandamsire of Destination Moon. These are again classy old bloodlines and with a fairly up close dose of trotting blood and both are descending from Volomite and maternally tracing to the wonderful Roya McKinney and Scotland/Rose Scott. Zenterfold’s grandam Now And Zen is also chokka with trotting blood via her sire Chiola Hanover. Chiola Hanover goes back to Volomite and the Scotland influences as well. 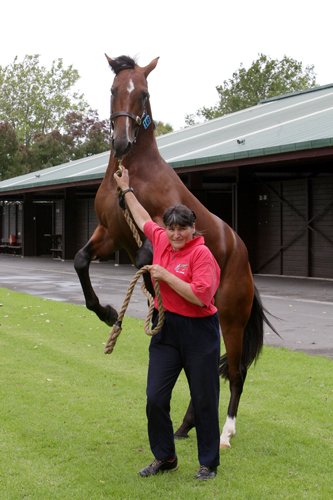 But none of that is an issue for Grin, thanks to his breeding, especially Storm Damage who is described by John Bradley as having “some of the oldest bloodlines still available for pacers” – his dam was 24 years old when she foaled him, and he is a remarkable “sleeper” in the pedigree of a modern day sire. Phew! that’s a little peep into some deep old echos in a 2yo pacer just launching his career. Of course what I also liked about Grin was his ability to leave guts, character and grittiness, which The Blue Lotus showed in her races too. That gave the Zenterfold speed-at-all-cost attitude something to hang its hat on. It’s what might work for a particular family that counts. And that’s what I think about, more than what is the most fashionable option at the time. 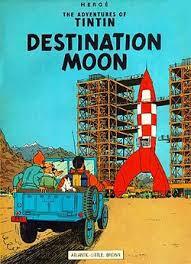 Destination Moon has a long, long way to go. The rocket is just launched, yet to fire the booster engines and go into the statosphere. I hope he ends up amongst the stars. A bonus from my trip to the NZSBA breeders conference in Christchurch was the opportunity to visit Nevele R Stud and see Tintin In America, whom I bred, and some of his weanlings. My visit was a lovely echo of my only other trip to Nevele R, which happened the year I decided to put Zenterfold to McArdle, which resulted in Tintin In America being born. That day was just the same – raining, and the array of famous racehorses/sires standing in their paddocks with their covers on, looking just like any horse. I particularly recall Courage Under Fire (standing at Nevele R at that stage) who looked almost lost under his cover, being the small horse he is, as the rain poured down around us. That was about 8 years ago. Kym and I were shown around personally by Bob McArdle; it was a fascinating tour with plenty of commentary by Bob, followed by a fairly robust discussion as we all sheltered in our Hilux ute and debated the merits of putting my mare Zenterfold to Falcon Seelster (which Bob advocated) or McArdle (which I was more interested in doing). As history shows us, I stuck with McArdle. So it was lovely last Saturday to come full circle and be standing alongside Tintin In America the sire, in the rain, at Nevele R all these years later. Tintin retired very sore in one leg joint after super seasons as one of our top racehorses from 2yo to 4yo, and almost reaching a million dollars of earnings. The good news is: he is very well in himself and full of attitude in the paddock, and very fertile in the barn. Thanks to Nevele R in doing such a good job in settling him in to his new career. There’s no doubt what sticks in people’s mind about Tintin is his incredible acceleration and speed. As he grew older he developed the strength to hold that sprint longer. At times, he appeared to be low flying down the home straight. That sort of acceleration is hard to come by. He was a medium sized horse, but a first foal from a medium sized mare. From what I have seen, his foals are quite striking types of good size. I saw two at Nevele R and both had white blazes which could be their own family influences but I have also noted the blaze/snip influence in Tintin’s family. Interesting. I’d love to hear from people who have foals/weanlings by Tintin. Email me at bee.raglan@xtra.co.nz and tell me about them. Personally, I am negotiating a share in a well bred weanling filly by Tintin In America, and have leased another mare to put to him with a very interesting pedigree match. But more about those at a later date. I’m a careful and thoughtful breeder and I believe he’s worth a good punt as a sire. I’ve just returned from the NZ Standardbred Breeders Conference in Christchurch on Friday 17 May. I applaud the organisers for gathering a great line up to get us thinking, and tip o’ the hat to Michael Guerin – his Q&A sessions with Karen Parsons and Cran Dalgety were a highlight, and his summing up at the end of the conference was a call to action that would have set the conference alight if it had come at lunchtime. My only quibble with an otherwise very good conference: poor timing at the start meant the workshop/discussion session at the end was truncated and lacking focus. It was an ideal opportunity for John Mooney et al to get some support and direction from active and interested breeders through real workshopping of ideas. Having that number of well informed breeders from different parts of the country in the same room is rare. It creates an exchange of ideas that surveys and submissions can never achieve. Perhaps a raft of workshops on specific ideas arising from the conference (and elsewhere) could be held around the country over the next 6 months to put some flesh on the bones and give some life to Mick Guerin’s apt comment that the breeding industry must settle on its priorities and get much more coordinated and clever about its tactics to push those into the wider harness racing (or general racing) agenda. Dr Jenny Cahill spoke on the importance of genetics. Her recap on the basic principle of “pairs” was an apt salute to the equal importance of sire and mare. It takes two to tango, right down to the chromosone level! She also placed a realistic perspective on the contribution of genetic making up to a performance horse, noting that complex inherited traits ( e.g. some performance measures, height, temperament, and a number of diseases) are affected by a number of genes and usually also modified by environmental factors (such as training and nutrition). As equine genetic research moves into the field of complex traits, Dr Cahill said breeders need to feed into research programmes what they are most interested in finding out. For example, the dairy and beef industries are further down that path and have clear objectives of what research can help them produce better products for a changing market. For some equine breeders, genetic research will be a step too far to contemplate, but it is going to happen. We must embrace and direct it, or we are just burying our heads in the sand. Dr Cahill says “the ultimate goal of this research is to be able to use the information gained for the good of the horse, owners, breeders and trainers and to be able to screen individual horses for these traits.” This would include testing for heritable conformation faults and diseases, and also good gaitedness and even the type of performance they are “wired” to achieve (speedy sprint, medium distance fast, stamina/slow). All this has HUGE implications for breeders, buyers and sellers. Some thoroughbred markets are already using available information. How would we use it? What impact would it have on numbers bred and sold if we cut out all those horses in advance who will only make up the numbers in a race? How would it change our yearling sales, if overnight buyer-requested testing became available? Fascinating stuff to ponder! Dr Clarissa Brown Douglas, speaking on nutrition of the mare and foal, gave a wealth of useful information, emphasising the importance of feeding correctly in those critical formative times. Her take-out messages were simple: Managing growth is a balancing act. The last trimester is a vital time to ensure the foal gets the minerals, trace elements and vitamins required. Get to know the nutritional value of what you are using – pasture and hay as well as commercial feeds and balancers. Mares milk lacks minerals so in that vital last trimester, the foal stores the minerals it needs in its liver for use during the first 90 days of its life. A foal is born with only 17% of mature bone mineral content, and maximum bone mineral content is not achieved until a horse is about 5 years old. The 6-12 month period of feeding a weanling is a “window of opportunity” and you need to monitor growth rate so you don’t overload the immature skeleton structure. Yearling preparation is best done gradually over 90 days. Be aware of the potential for high glucose/insulin response in young horses – low glycemic feeds are a good way to prevent this. So it really makes you think about the pressure we put on such an undeveloped creature when we race horses as 2yos! And if we continue to do that, it places a big responsibility on breeders to lay the best foundation possible. I am sure NZSBA will be publishing the papers presented by all speakers at the conference on their website. It’s great food for thought. The industry analysis (both harness racing in general by Edward Renall, and breeding industry by John Mooney) provides some good basis for discussion. But as Mick Guerin said, we need to pin down and agree on our priorities, and push our agenda forward in a united way. We will get nowhere by griping and sniping, riding the ocean like flotsam and jetsam, carried on currents that seem out of our control. I grabbed a chance right at the end to raise my idea of increasing the breeding option to one foal and one ET per mare per season, outlined in other blogs. I got a strong positive response from several breeders to this suggestion – including a commitment from John Mooney to start following it up. Likewise Brian West raised the need to get a monetary return into breeders’ hands via a % slice of stakes, as they do in France where breeders are recognised as the key investors in the industry’s product. These ideas are not as “out of the box” as we might think. As I said, a series of workshops or think tanks around the country could pull together some recommendations. Let’s get some fresh voices and fresh ideas in the mix. Complete change of tack from my recent blogs – here’s a blog about my mare Have No Secrets. Many of you willhave discovered one of my early pageswhere I wrote about My Learning Curve when I first started breeding standardbreds. The mare I wrote about was Have No Secrets, by Camtastic out of the Vance Hanover mare Mafia Miss, who herself was a daughter of Joyable. This is the family of Robert Reid’s good mare Plead, and the best branch of the family has been the Pat Hanover/Miss Clevedon line. Joyable was a very nice racehorse, earning over $220,000 racing in Australia; her progeny included the speedy youngster Gran Montana, but not much else. Mafia Miss produced a durable pacer in Seven Hills who raced in Australia for many wins, and in fact most of her progeny other than Have No Secrets ended up in Australia (the Kellys in NSW) but their breeding efforts have been very disappointing. Nothing much has really fired at all, apart from Miss Adriana and Miss Livia from Have No Secrets’ half sister Midnight Madam (by What’s Next). 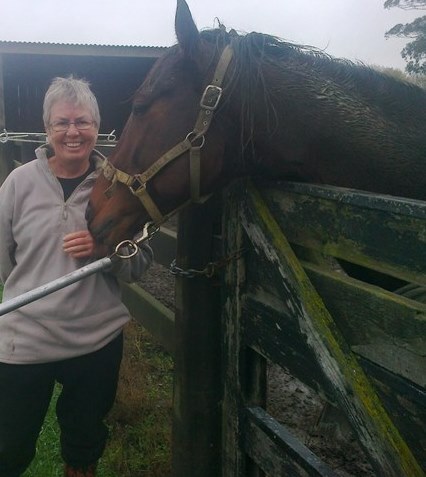 I fell in love with Secrets at the yearling sales and when she put her head on my chest in her box at Karaka I told her “I’m taking you home.” After realising early on the “Secrets” was not interested in being a racehorse, I bred three foals from her – and went up that steep learning curve which My Learning Curve relates. Iain and Secrets hacking on Iain’s property. She is now 14 years old. We’ve looked after her well and she’s been an asset, never a burden. Kym broke her in to saddle early on, and she has been ridden occasionally, including a memorable afternoon when she was 3yo and I was perched in the saddle. Me riding is not a pretty sight, but Secrets was patient with me, even ensuring I stayed on board when we slipped into a ditch rather than giving that cunning little tilt-and-off that horses will try when they know you are a nervous rider. She’s always showed a character that was gentle, kind and yet had a distinctive personality and an interest in whatever was going on. For the usual reasons – lack of paddocks, tight finances – it was time to move her on to a place where she could also be more active, have more company. It was with great pleasure that I found Iain, who is an experienced rider and has a property near Hamilton he wanted to explore on horseback. After a few weekends of getting to know each other, he and Secrets have paired up wonderfully well. Iain’s kept me posted about progress, hence this lovely photo. “She is so inquisitive as she explores new territory – what is around the next bend. Definitely not a plodder, a lady with character and attitude,” he writes. 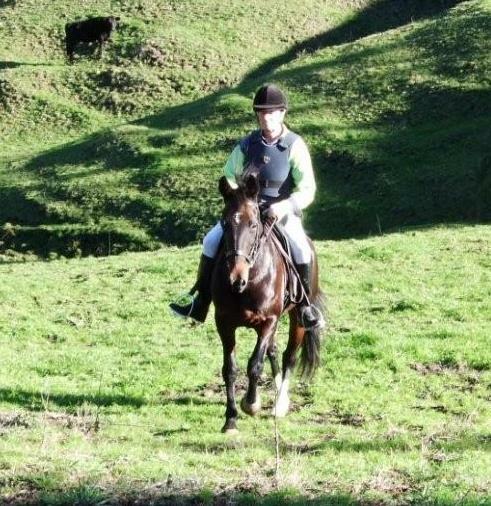 Secrets has found an excellent home and is loving her new life as a hack. It’s never easy finding homes for ex-racehorses, and I know there are calls that have to be made from time to time. There are people and groups who can help if you want to try harder to give your horse a life after racing – and certainly breaking a horse to saddle (if they have a good temperament) early in their life can be a life-saver later on – as well as an option for training regimes at certain times. In this case, credit to Kym for ensuring Secrets was ride-able. And credit to Secrets for being so sweet and such a character that finding a good home was the only option. Wrapping up my short series on some positive steps for our breeding industry. These are, in general, solutions that are in our hands. While significantly higher stakes would help all parties in the industry and create a more buoyant market for breeders, breeders and their representatives are not in a position to directly make that happen. What we can do is make decisions on the four aspects I’ve covered – or at least lead the charge in pushing for change. The four things I’ve suggested all increase the ability of breeders to be masters of their own destiny. Allow breeders to breed 2 foals from an individual mare (no more than 2) per breeding season. Place a limit of 100 on all NZ available stallions for the next 3 years. Create meaningful breeders bonuses related to first win (larger amount) or all wins (smaller amount per win) or % of stake of all NZ-bred horses – this is a progeny bonus, not just applicable to fillies. Breeding credits, and paid to the original breeder (not the future owner of progeny). Allowing a mare to breed up to two progeny in the same season, using embryo transfer, appears to be something governed by the rules of harness racing, and therefore able to be changed. It is well within the jurisdiction of our representatives (whether at conference level or at governance level) to lead a change in this direction. For a good overview of the logistics here is an article that outlines it in layperson’s language. The logistics and costs of embryo transfers will limit use. It is not opening the floodgates to factory farming, nor is it likely to dramatically increase the number of registered foals. But it will provide breeders with another option in terms of managing their investment in a mare, and it may well encourage breeders to experiment a little more in their choice of sires. Check out my original blog on this for the full list of benefits. Placing a limit on books is a tricky one because of legal rulings. It may need some hard negotiations and some clear parameters, but a short-term agreement maybe covering 3 seasons could be enough to ensure greater diversity and commercial viability of both sires and stud farms to keep our industry healthy. Yes, successful sires (and their owners) should be rewarded by getting increased numbers of mares. But there is a point where, over a number of years, dominance can skew a market (and even the genetic make-up of our commercial mares). Eventually the market will self-correct – or more likely set the pendulum swinging in another direction. Settling the market into a healthier, less extreme pattern over the next few years will build a stronger and more stable foundation for our industry. Finally the idea of mares credits and breeders bonuses – these depend on having a pool of money that can be distributed. And that’s the rub. I believe the only way the breeding industry will strengthen is for breeders to develop some funded schemes that are independent of the funding of the wider racing industry. It’s true, that sometimes you have to put more in to get more out. As a breeder, I already pay numerous “series” eligibility payments that are designed to make my mare’s progeny attractive to buy. In the yearling sales marketplace they are essential – but you will see many, many yearlings who are paid up for multiple series still receiving only $5-10,000 sale price. Basically, breeders are paying several hundreds of dollars per yearling for series which are extremely hard to win and offer small, if any, immediate return to the breeder even if the horse makes it into the final of these series. So why not have an additional option – payment into a scheme that relates directly to the breeder and the mare’s progeny and rewards breeding success – either a mares credit scheme or a breeders bonus for wins. I would be a willing payer of $250 per foal or per mare bred, for example, if I knew it was making me eligible for reward and recognition as breeder if that horse goes on to succeed. I would willingly pay a small annual fee if it kept me in a breeder’s bonus scheme. I would see that as an incentive and an investment, rather than a cost. Money attracts money. Positivity attracts positive responses. I think potential sponsors would be keen to step up and contribute more to breeders schemes if breeders started developing some really exciting options that would give breeding a more modern and commercial shape. So yes, I will put up my hand (and I am by no means a wealthy person) and say: Let’s put more in. Let’s create something that is ours. Don’t wait for handouts. Have more control because it is our funds, from breeders and for breeders. Where do you stand on that? 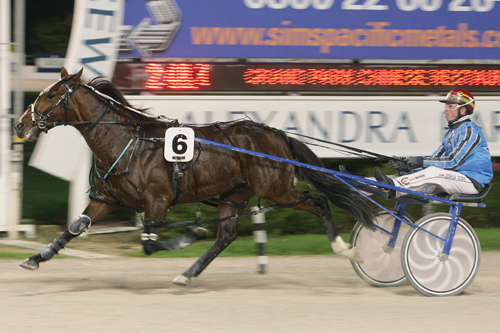 OK back to part 4 of my 4 solutions to the NZ standardbred breeding industry. This time – mare credit schemes. Any struggling industry has to make calls about how much effort they put into keeping loyal (existing) customers and how much they incentivize new customers. But are we getting the balance right. The push with current mare credit schemes in some Australian jurisdictions is to provide mares credits ( usually for service fees) attached to their fillies who hopefully then become a more attractive as breeding propositions for the current or future owners. The focus is on the future – trying to get more value embedded in fillies as racing then breeding prospects. Mare credits go with the filly produced (and for that filly’s owner to use) rather than to the original broodmare or the breeder who produced the filly. So we are downplaying the role of the breeder and broodmare, and up-playing the role of the progeny’s owner as a “potential breeder”. Hanging out a carrot for someone who may prefer onions. While the carrot eaters are very, very hungry. Say I bred a filly from my mare. Sold the filly at the yearling sales, got $15,000 and cover my costs, just. She is paid up in a mares credit pool, which may (or may not) have made her more attractive to buy. That filly becomes a 5 win mare with some potential to make a good broodmare. But who gets the reward for those wins? Not me, the breeder who made the decisions and took the risks. Not necessarily the person I sold my broodmare to, when I couldn’t afford to keep her any longer. No. The rewards appear to go to the person who currently owns the female offspring, even if they are not interested in breeding … Que? There is a breeder and a broodmare out there, trying to gain traction, who is missing out on the rewards of success. But in our desire to stimulate a future market for buying fillies and breeding from them, we could be cutting back the scarce benefits for current “loyal customers”, the breeder and the broodmare. That is why I strongly advocate looking at mares credit schemes – but that they are attached to the successful broodmare and her owner rather than the offspring filly and her owner. Quality broodmares is what we need to encourage and reward. Breeding is a long and often hard road to achieve success, with many risks along the way. Isn’t that experience and effort worth investing in? My suggestion is that mares credits are attached to the current owner of the broodmare and are accumulated and transferable to any of her female progeny. So the original breeder of a successful filly has the opportunity to use credits for the broodmare herself, or trade credits to owners/leasees of the mare’s fillies or include them as incentives for sale of her fillies at any age. There is little cost to the industry unless credits are “cashed in”. But this system would provide some recognition for the breeder’s role in providing winning fillies/mares and future breeding stock. If we look at mare credit schemes in New Zealand, here’s hoping we take a harder look at who really needs to benefit and how.